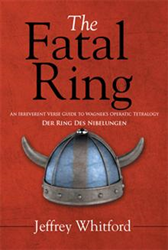 ADELAIDE, Australia – Consisting of more than 490 piquant and amusing quatrains, “The Fatal Ring” (published by Xlibris AU) unconventionally retells the story of the four operas comprising Richard Wagner’s “Ring of the Nibelung” and, with a blend of irony, whimsy and some contemporary flourishes, guides the reader through the pathos, tragedy, drollery and carnage which constitute this epic tale. Many lovers of classical music are reluctant to attend (or even listen to) a performance of Wagner’s “Ring of the Nibelung.” This reluctance is often founded on the beliefs that the music is impossibly dense and bombastic and the story complex and difficult to understand. Although many descriptions of the narrative have been made and there are also excellent translations of the libretti, the belief abounds that Wagner’s music and Wagner’s words constitute the dangerously deep end of serious music and the operas are really suitable only for high end intellectuals, poseurs and eccentrics. Author Jeffrey Whitford believes these views to be in error although admits that they were once partly shared by him. This verse version of “The Ring” was commenced to familiarize himself with the narrative and to amuse friends prior to his and their first attending a performance of “The Ring”. It has been belatedly completed with the intention of sharing his enlightenment that both story and music are not only highly approachable and fulfilling but actually also a great deal of fun. This deft and humorous rhyming narrative is an appropriate introduction for those new to “The Ring” and is perhaps even more suitable as an entertainment for the relaxed and tolerant Wagner connoisseur who already has a detailed understanding of the music, characters and plot.